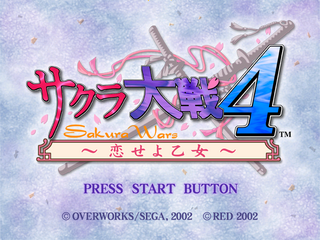 Sakura Taisen 4: Koi Seyo, Otome (サクラ大戦4 ～恋せよ乙女～) is the direct sequel to Sakura Taisen 3. It was released for the Sega Dreamcast and PCs exclusively in Japan. It has a sequel, Sakura Wars V: So Long, My Love. Main article: Sakura Taisen 4: Koi Seyo, Otome/Magazine articles.